Bamboo is a grass, not a tree and can be harvested many times over from the same stalk without replanting. It normally reaches maturity within 5 to 7 years and grows to heights of 50 feet or more. The rapid harvest time and regeneration properties, makes it the leading eco-friendly flooring choice. Bamboo has a very high tensile strength and is used in such applications as solid bamboo flooring and engineered flooring. Cork comes from the bark of a cork oak tree. The cork bark is harvested every 9 to 14 years. The tree is never cut down and the habitat is not disturbed. 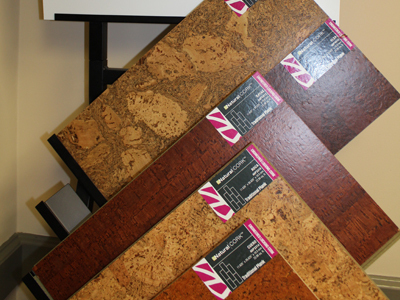 Cork has a natural microbial and will not entrap fungus or germs, helping to create a healthy indoor environment. It is warm to the touch and reduces sound. It will maintain a comfortable floor temperature year-round and reduces noise levels.